WASHINGTON The U.S. Postal Service today issued a new commemorative postage stamp saluting the nation's veterans and those who continue to serve in veterans service organizations and other veterans groups. The national Honoring Veterans stamp first day of issue ceremony kicked off local stamp dedication events at many postal facilities across the country. The 34-cent self-adhesive stamp is available at all post offices starting today. "The Honoring Veterans stamp pays tribute to the patriotic dedication of all the men and women who have served in the U.S. armed forces," said S. David Fineman, Vice Chairman of the presidentially appointed Postal Service Board of Governors, who dedicated the stamp. "The stamp also serves as a 'thank you' to those veterans who continue to serve as members of veterans service organizations," he said. Among those joining Fineman at the ceremony were Reps. John D. Dingell (D-MI) and Lane Evans (D-IL), Anthony J. Principi, Secretary of Veterans Affairs, and Deborah K. Willhite, Senior Vice President of Government Relations and Public Policy for the Postal Service. Many veterans continue to serve their country, their fellow veterans and their communities by becoming members of veterans service organizations. These organizations provide aid to veterans and their families, including assistance with benefit applications, transportation to Veterans Affairs medical facilities and burial and memorial services. Local communities also benefit from the work of veterans service organizations, through scholarship programs, youth sports activities and other programs designed to promote civic pride. The present population of U.S. veterans is estimated to be nearly 25 million. Designed by Carl Herrman, of Carlsbad, Calif., the stamp features a photograph of the United States flag. One of the most recognized symbols of freedom in the world, the U.S. flag also symbolizes the patriotic service to the nationin peace and warof all U.S. veterans. 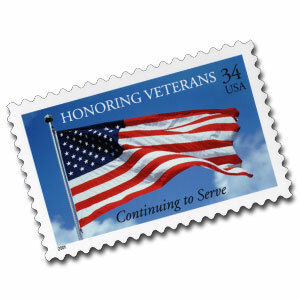 The phrase "Honoring Veterans" appears at the top of the stamp, and the phrase "Continuing to Serve" appears at the bottom.